Karma Thinley Rinpoche recently stopped off on his annual journey from Nepal to Canada, visiting London for a few days from 10 to 12 September. As always, he he will spend the winter in Canada before returning to Nepal in the spring. Despite the ups and downs of life in Nepal the resident nuns in Rinpoche's nunnery, Tegchen Legshay Ling, continue to accomplish their religious duties and practices. Rinpoche was hosted in London by Lama Jampa Thaye and Dechen Dolma and spent a very enjoyable visit in the capital, accompanied by his long term assistant Kunga. Rinpoche was in excellent health and during his stay was able to talk to Lama Jampa about the forthcoming visit to London of His Holiness Sakya Trizin. 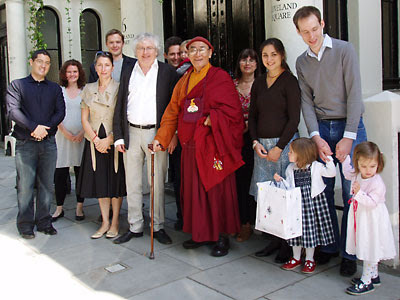 He commented that it was extremely significant that His Holiness would be giving the Kalachakra initiation in London as Kalachakra is the most important of all tantric intiations and London is the greatest city in the world. Rinpoche also stated that whoever receives this intiation will have the karmic connection to be reborn in the kingdom of Shambala at the time of the Rigden king, and to participate in his defeat of all obstacles to the dharma.